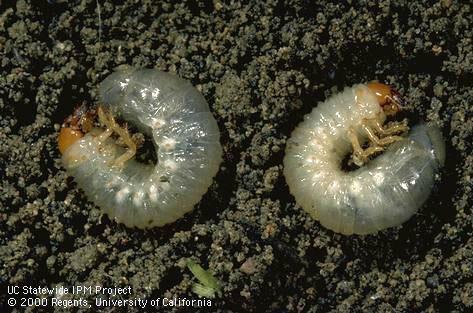 Grubs are the larval stage of the adult beetle. Grubs are normally out of sight in compost bins or in the root zones of lawns, while beetles can be seen crawling or even flying around. Some do more damage as larvae, such as the Masked Chafer which eats grass roots and kills sections of lawn. 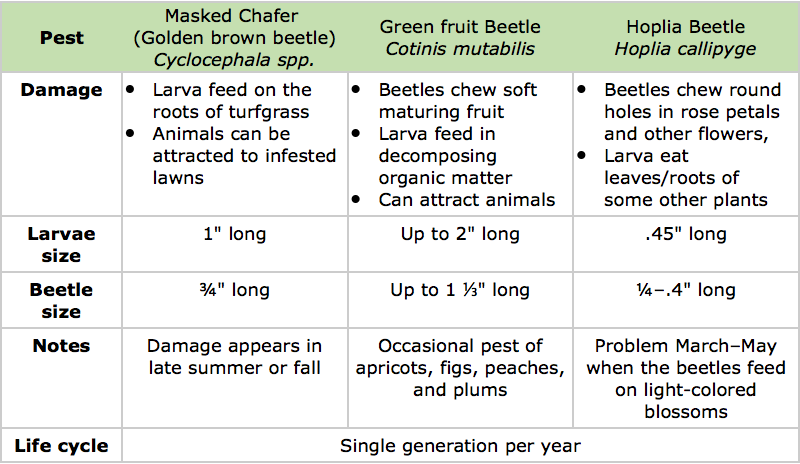 On the other hand, the Green Fruit Beetle helps in decomposition in the compost pile as a grub yet eats fruit in its adult form. See the chart below for help in identifying what’s in your garden. 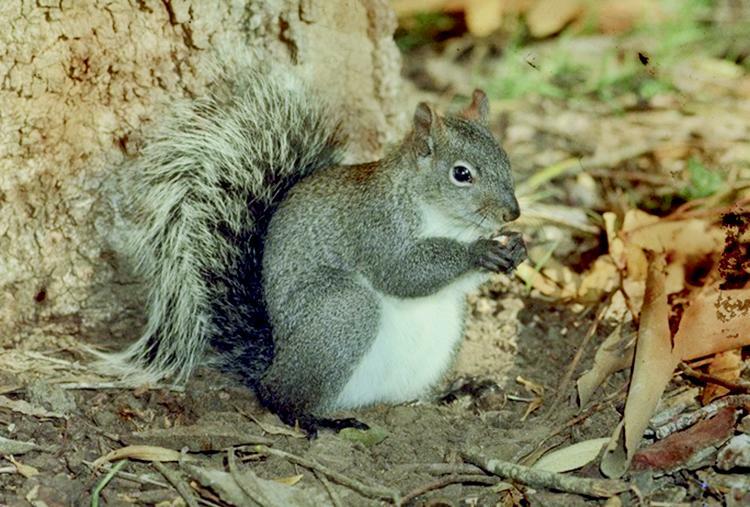 While grass is losing favor in our drought-prone climate, there are still many lawns around. Mowing properly can have an impact on turf health and water use. Set the mower height at the high end of the optimum mowing height range for the type of turf in your lawn (see guidelines for warm and cool season grasses). 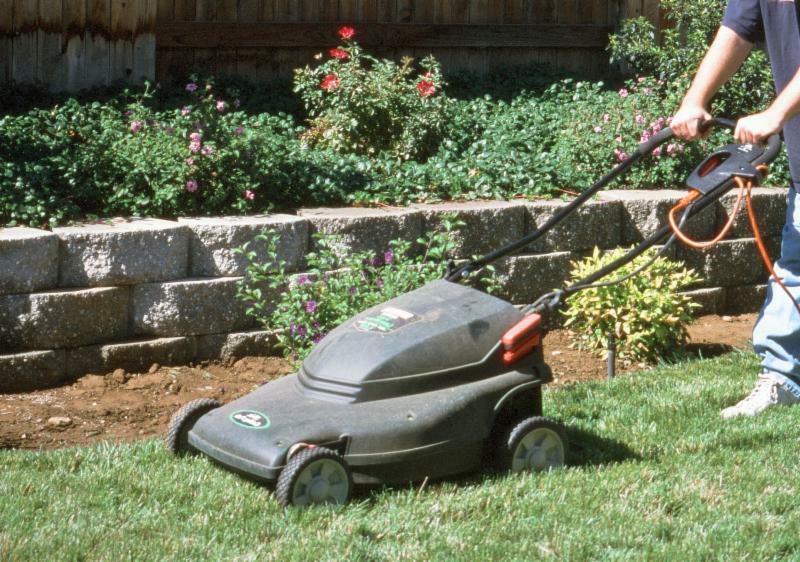 Mow often enough so that you are cutting off about a third of the grass height at a time. Proper mowing height and frequency make sure the grass has enough leaf surface to photosynthesize plenty of food and grow deeper roots. Keep the mower blades sharp to give a clean cut with less area for pests and diseases to take hold. Consider using a mulching mower which deposits finely cut grass back on the lawn, holding in moisture and returning nutrients. Combined, all these steps promote a healthier, more drought-tolerant lawn. The great thing about planting in containers is that you can do it just about anywhere, no matter how small your space. You can plant flowers, vegetables, herbs, or even small trees – outdoors or in. Make sure to use a lightweight potting soil rather than clay soil from your yard which can get very hard in a pot, particularly if it dries out. 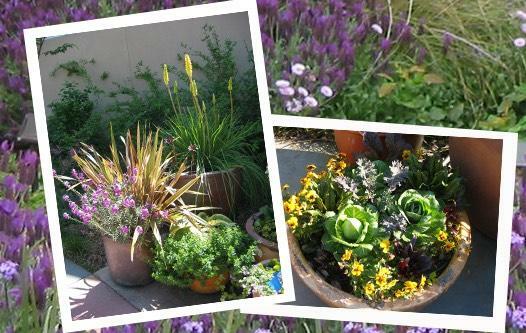 Water and fertilize container plants regularly because they can only draw from a limited area inside the pot. Let your imagination go wild with container choices, just making sure that whatever you use has drainage holes in the bottom. Consider re-purposing old western boots for cactus, a colander for salad greens, or a sugar canister for Stevia . Most basil grown for culinary purposes is annual. This means it completes its life cycle in one season and must be replanted every year. To keep it producing new growth through the summer, harvest the earlier leaves as they get larger and before they get old and turn brown. And be sure to pinch off any flower heads that start to form right away before they can go to seed which would be the completion of its life cycle. The plus side to letting it flower is that it will attract bees and other beneficial insects to your garden. A tender perennial form of basil is African Blue basil whose flowers attract lots and lots of bees. 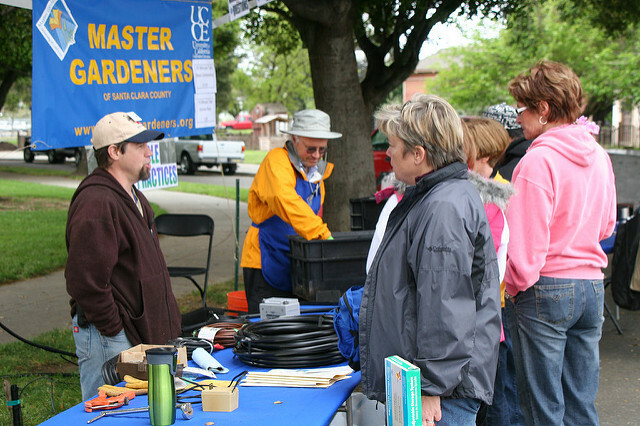 We offer lots of free or low-cost gardening talks, workshops, and courses all over the county, as well as hosting information tables at many community events. Please join us and bring your questions! Come see what we're growing at our edible and water wise gardens and get answers to your gardening questions. Feel free to bring plant pests or disease samples for identification. We're located at Eleanor Pardee Community Gardens, on Center Road near Martin Street, Palo Alto (v iew map ). Have a gardening question? Contact our Hotline (for Santa Clara County residents). Start by reviewing our plant problem diagnosis tips .